An elite test and some additional post-test training with Diamond can help anyone with a keen interest in riding and for those who want to improve and enhance their current skills. If you are a professional rider trainer you may wish to take the Diamond elite test with a view to becoming a Diamond examiner or you may have a motorcycle training school or be part of one. Being a Diamond accredited school will mean you can offer Diamond training and testing at your centre. Having a Diamond elite test will enhance your own rider skills, which in turn will give you more confidence when either riding for pleasure, work, returning to riding after a break or in a training environment. With riding becoming ever more popular having a high level of skills will help you to cope with all types of road situations including motorways, rural and built up areas. Companies looking to train their riders to the highest level can book an elite test and training to enhance their rider’s skills. With improved knowledge in anticipating and observing hazards, elite riders are less likely to be involved in a road traffic accidents, saving a company money and time. When you book your Diamond test, you will receive email confirmation of your booking. Your details will then be passed on to an examiner local to you, who will contact you within 2 working days to arrange a mutually convenient meeting place. The Diamond elite test lasts for 90 minutes covering a variety of roads and where possible motorways and rural areas. You will be expected to carry out an emergency stop, figure of eight, a commentary ride for approximately 15-20 minutes and a slow riding exercise, if asked to do so. A pass will be awarded if you achieve no serious or dangerous faults and you do not exceed 2 rider faults in the same category. Obvious benefits are safer and better riding skills. Diamond trainers focus on defensive and eco riding techniques, which in the long term can reduce road traffic accidents and loss of no claims benefits etc. Companies can also expect to save money through a reduction in accidents and incidents as riders are safer and better equipped to cope with stressful situations. This in turn creates a more positive working environment and less time lost in work for sickness and stress. Having a Diamond elite test certificate may give you substantial discounts on your insurance. Be sure to mention your elite test pass to your insurance company to see if they can quote you an appropriate discount. Your Diamond certification is valid for 3 years. Should you wish to take any of our Diamond tests you can use our contact form or call the Diamond team on 020 8253 0120 and we will allocate an examiner to you based on your requirements. You may have already been recommended a particular examiner by your trainer, in this instance we will of course be happy to discuss your individual preferences at the time of your booking. Our examiners have had extensive training with the DIA in their area of expertise and adhere to the DIA Code of Conduct. 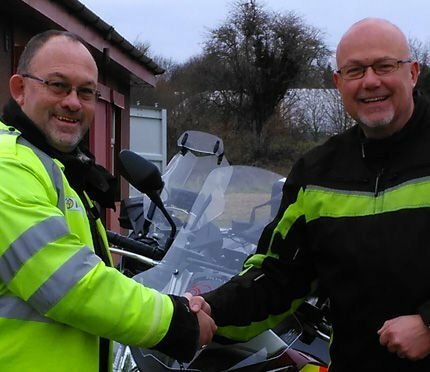 All Diamond trainers and examiners are registered with the DVSA’s voluntary motorcycle scheme. I have been riding motorbikes since 1989. Initially, I had no particular interest, but my girlfriend at the time kept using my car so needs must. I bought myself an MV 125 two stroke. I made enquiries with Mark Jaffe of Phoenix Motorcycle Training School and Chief Motorcycle examiner for Diamond. Within two weeks we were meeting at Starbucks in Hooley for my test. Because I wanted to become an examiner, I needed to pass the Diamond elite test. Although I had taken many tests in the past, I was still nervous, but Mark put me at ease. He was riding a Honda ST1300 and I had my Honda NC700 Integra. We set off, out the car park to the junction and oh no I’d lost balance and put both feet down. Is that a fail already? I composed myself and set off into a 50mph limit dual carriageway fairly briskly. By the time we’d got to Merstham I was at ease. We then shot across country with a myriad of differing speed limits. We travelled through a couple of villages, along main roads and then again cross country. We were still zig zagging through the countryside but the roads were getting wider with spectacular views. Then we ended up at the DIA headquarters in Croydon. Mark congratulated me straight away, I had passed with no faults! The next stage for me is becoming an examiner. A big thank you to Mark for helping me settle in to the journey. I didn’t realise there were so many great roads on my doorstep.